HONG KONG, CHINA--(Marketwired - Oct 27, 2017) - FrieslandCampina (Hong Kong) Limited ("FCHK") is honoured to be crowned as one of the 'Top CSR Advocates in Asia' in the Asia Corporate Excellence & Sustainability Awards 2017 ("ACES"), recognizing FCHK's great success in its CSR initiatives. FCHK is recognized as the company that lead various CSR initiatives integrated into own policies and operations, and has a high level of employee and top management involvement in the programs. FCHK is committed to nourishing the lives of HK people across all ages with its full range of high quality and nutritious dairy products, as well as to leverage industry expertise and establish CSR initiatives through cross-industry partnership built with local NGOs, academian and industry experts that created amplified impact to the society, and is recognized as one of the companies with genuine interest in the well-being of all of its stakeholders this year. Healthy lifestyle advocacy encouraging "Drink, Move and Build Strong Families Together"
By celebrating World Milk day annually, a day initiated by the Food & Agricultural Organization of the United Nations, FCHK advocates for Hong Kong families to "Drink, Move and Build Strong Families Together." Through the celebration of World Milk Day ("WMD"), FCHK aims to strengthen the awareness and foundation of healthy lifestyles among Hong Kong families: a balanced diet with daily intake of two glasses of milk a day and regular exercise of at least an hour each day. Since 2013, FCHK and its brand, DUTCH LADY®, have reached over 220,000 students through WMD School Tours at kindergartens and primary schools as well as WMD Family Fun Day, the public event as a platform for local families to enjoy the fun of outdoor exercise. In 2014, Hong Kong-style milk tea making technique was listed in The First Intangible Cultural Heritage Inventory of Hong Kong; and recently in August it was chosen to be part of The Representative List of Intangible Cultural Heritage of Hong Kong down from a list of 480 items. While the hand-made Hong Kong Styled Milk Tea is a signature local food culture, the cha chaan teng industry where this local beverage is served has been facing talent shortages in recent years as many senior milk tea masters are retiring. In view of this, FCHK and its brand, BLACK & WHITE® are committed to preserving the craftsmanship of Hong Kong-style milk tea making technique. Since 2013, the company and the brand have been organising the annual Hong Kong Milk Tea Day and the New Generation Milk Tea Master Training Program to promote the Hong Kong-style milk tea drinking culture and making techniques. To date, FCHK has trained over 125 professional Hong Kong-style milk tea masters to fuel the cha chaan teng industry. Recent healthcare figures reflected Hong Kong has become one of the most rapidly-aging cities in Asia, FCHK and its brand, OPTIMEL launched Tailored Nutrition for Age promotion campaign to raise public awareness on healthy aging and educate the public on the importance of nutrition for physical mobility, heart health and cognitive health to Hong Kong senior community from age 40+, 50+ and 60+ onwards. FCHK health ambassadors introduced professional healthcare recommendations, accessible nutrition and physical health knowledge to the community. The company has worked closely with nutritionists and elderly home to expand its outreach through health tours and online self-assessment tools. Mr. Harvey Uong, Managing Director of FrieslandCampina Hong Kong, commented on the award, "We are honoured to be crowned one of the 'Top CSR Advocates in Asia' by the Asia Corporate Excellence & Sustainability Awards 2017. We aim to formulate our CSR initiatives in order to leverage our industry expertise and operational competencies and concentrate our resources and efforts to address the identified social issues. Furthermore, we embed CSR into the company's planning and budget process to ensure support from top management team and encourage colleagues to join hands giving back to the community. We have been developing strategic partnerships with key stakeholders in various CSR projects, including NGOs, schools and universities, experts and key opinion leaders, customers and business partners etc. to maximize the reach and impact. We are proud of receiving continuous support and maintaining long-term relationships with these partners that ensuring the programs are sustainable." 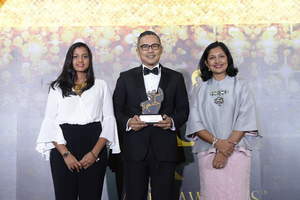 The ACES Awards, organized by the MORS Group, recognizes successful companies and individuals in Asia across two main domains; leadership and CSR. The awards value and recognize services and achievements of businesses, both large and small, national and international, for their esteemed contributions to their communities and the world. "The Top CSR Advocates in Asia" is presented to companies that lead various CSR initiatives integrated into its policies and operations, and has a high level of employee and top management involvement in the programs. The CSR initiative's focus area includes community engagement, environment, and social empowerment. Ultimately, the top CSR advocates are companies with genuine interest in the wellbeing of all of its stakeholders. FrieslandCampina (Hong Kong) Limited (FCHK), a subsidiary of Royal FrieslandCampina, has maintained a long presence in Hong Kong since 1938, providing high quality and nutritious dairy products including FRISO infant and toddler milk formula, DUTCH LADY dairy based beverages, OPTIMEL adult nutrition formula and dairy products including BLACK&WHITE and LONGEVITY, for consumers, customers and food service business partners in Hong Kong and Macau, nourishing the lives of local citizens across the whole life span.